Panini NBA 2018/19 Basketball STICKERS #1-250 BUY 4 GET 10 FREE! Fit For: Laptop, Luggage, Travel case, Car, Motorcycle, Bicycle, Skateboard, Plate, Guitar, Furniture, Window, Table etc. Condition:100% New Quantity: 32 Pcs Stickers Feature: Waterproof, Removable Usage: Make sure clean the surface before you paste!!. Logo vinyl (PVC) sticker. Material: Printed on high wuality vinyl (PVC) sticker. the sticker, make sure your surface is free of dust and/or. Contoured cut (around the logo) with rounded corners. soft tool or your fingernail to ensure the logo stays on the. Sun protection and waterproof. Step to use the stickers 42 pieces of stickers. Clean then surface ,then sticker on. 10 Packs NBA 2018 / 2019 Panini Stickers - Free Postage. Condition is New. Dispatched with Royal Mail 2nd Class Large Letter. Un-used & in very good condition for age. Aprox 132 stickers in good condition. containing panini basket ball 95-6 (95) 96-7 (5), upper deck 95-6 & 96-7 (32). 1 x loose sticker set consisting of 287 different stickers for the panini NBA 95/96 album. Every sticker is there apart from sticker number 83 . This is a Over 99% complete loose sticker set. No sticker album is included. The color difference is hard to avoid in the internet sales. So, if you cannot accept this very little difference, be cautious before you are placing the orders. Vintage Panini : NBA Basketball 94-95 Sticker Album : 100% Complete. Fantastic gift for any Basketball fan. Condition: 100% Complete : Various wear and tear : No Missing pages or stickers.See Pictures and decide for yourself. NBA Basketball 97-98 Sticker Album : 100% Complete. NBA 2018/2019 STICKER COLLECTION PACKS AMERICAN BASKETBALL 49SEALED NBA STICKERS. Dispatched with Royal Mail Signed For® 2nd Class. This sticker is in mint condition. NBA Basketball Panini 2018 2019 Sticker Collection Album 70% completed. Dispatched with Royal Mail 2nd Class. 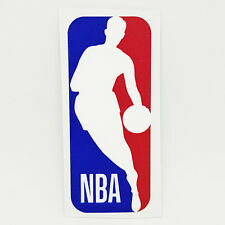 High Quality 43 PCS NBA club logo stickers 20 PCS Creative Caricature vinyl stickers Sticker Size: 5 cm x 10 cm Fun to stick on any hard surface They are quality screen printed on vinyl with self-adhesive backing, machine pre-cut Customize your Skateboard, Bike, Laptop, Desk......... whatever you feel needs sticker bombing !!!! Just clean the surface, peel off the backing and stick them on.